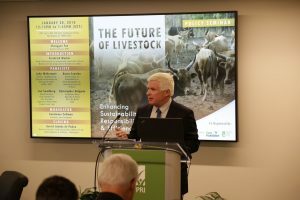 In his remarks, McDermott brought an international perspective to the event, focusing on livestock issues in low and middle-income countries. He noted that, of the 1.3 billion livestock producers globally, one billion of them are smallholders, and three-quarters of those smallholders are poor. He pointed out that, while much of the conversation about the livestock industry focuses on large-scale production, smallholders are focused on resilience and sustainability. Accordingly, policymakers have to be concerned not only about production when thinking about livestock, but also about the welfare of people. McDermott also highlighted the diversity in the livestock sector, as well as growing demand amid rapid changes. Changes to food systems that occurred across centuries in Europe are happening instead in decades in low and middle-income countries, he noted. The pace of these changes will only underscore the importance of figuring out how to support poor people to participate in markets with rapidly increasing quality and safety standards. “We are balancing competing needs: huge numbers of people and animals, and a huge amount of territory. (The transition is) also happening incredibly fast in low and middle-income countries. How will we manage this transition?” he asked the audience to consider. McDermott’s remarks complimented other perspectives in the discussion, which included the business sector and developed countries such as the United States. The event, co-organized by IFPRI, the Embassy of the Federal Republic of Germany – Washington, and Farm Foundation, was held on January 30. It built on the Global Forum on Food and Agriculture, held earlier in the month in Germany. 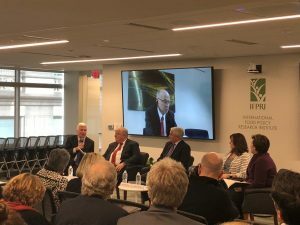 Video of the entire session, as well as full details on all the speakers, can be found on IFPRI’s website.